Welcome to the seventh issue which highlights a best-selling author's writing life and some writing tips. This publication appears bi-monthly. If you like what you see here, please forward this copy and use this link to subscribe. Bruce Wilkinson is the author of what Publisher's Weekly called the fastest selling nonfiction hardcover book in history. In 2000, The Prayer of Jabez, Breaking Through to the Blessed Life sold eight million copies and has a lifetime sales of 9.3 million copies. He didn't set out to write a bestseller, and in fact, Bruce wondered if he should ever write another book. In the mid-70s, Bruce founded a company called Walk Thru The Bible based in Atlanta, Georgia. Drawing from a concept developed in his Master's thesis, Bruce created the Walk Thru the Bible seminar. In just one day, anyone can learn the geography, characters and key concepts of every book in the Old Testament in chronological order. From the original six teachers, Walk Thru expanded to become the largest conductor of live seminars on earth with thousands of teachers worldwide. As a part of his work, Bruce wrote several books with meager to average sales. As a part of his passion in 1976, Bruce wrote a 278 page book on the prayer of Jabez which was never published. In addition to writing a book on Jabez and praying the prayer, Bruce often spoke on this topic. As a Bible college student at Multnomah in 1977, I remember hearing Dr. Wilkinson speak on the prayer of Jabez one evening at Hinson Memorial Church in Portland, Oregon. Yet until a couple of years ago, the timing wasn't right for a book to appear on the market. His publisher, Don Jacobson at Multnomah Publishers, continued to pressure Bruce Wilkinson for another book, yet he hesitated to put the energy into the writing process. "It's too painful," Bruce told Don. "I invest hours of time and energy into writing a book, then it only sells a few thousand copies? I'm successful in other areas of my life (such as speaking) and it's a better investment of my limited time." In the spring of 2000, Mrs. Shirley Dobson, the chairman of the National Day of Prayer Task Force and wife of Dr. James Dobson, Focus on the Family, called Bruce and invited him to be the keynote speaker at the National Day of Prayer meeting in Washington, D.C.. President Harry Truman declared an annual, national day of prayer in 1952 but President Ronald Regan set it permanently into law as the first Thursday in May. Several weeks later, Bruce called Don Jacobson with an idea. He knew key members of Congress and other government leaders would be attending the National Day of Prayer meeting in May. "Could we have a little book on the prayer of Jabez to give these leaders as a thank you gift?" Bruce suggested. Because of the late date, it would be tight to produce the book. Dave Kopp, an editor at Multnomah, and Bruce worked over a 90-day period but the little 94-page The Prayer of Jabez, Breaking Through to the Blessed Life book was almost an afterthought. The former founding editor of Christian Parenting Today magazine, Dave Kopp, and Bruce had worked intensely on an earlier book from Multnomah called Experiencing Spiritual Breakthroughs: the Powerful Principle of the Three Chairs (1999). Bruce's wife, Darlene, read the manuscript and felt it could have a large impact. She told Bruce, "I'm going to pray that this book sells a million copies." The thought of selling a million books sounded ridiculous to Bruce and he laughed. "The publisher had no advertising plan or strategy for the book to garner any attention in the market," Bruce recalls. Don Jacobsen, president of Multnomah Publishers, a respected small-to-medium Christian press in Oregon that publishes 120 titles a year, said, "Our big, brilliant marketing plan was to put it in the catalog and sell 30,000 copies over the lifetime of the book." For over 30 years every morning, Bruce had been reciting Jabez's prayer. Originally Bruce noticed the prayer as a senior at Dallas Theological Seminary in 1972. The simple directness of Jabez's request struck him. As he writes in the The Prayer of Jabez, Breaking Through to the Blessed Life, "Is it possible that God wants you to be ‘selfish' in your prayers? To ask for more—and more again—from your life? I've met so many earnest Christians who take it as a sign of immaturity to think such thoughts." The prayer itself is straightforward, an unabashed request that God bestow a generous blessing on the petitioner. Christians who believe it's selfish to ask God to bless them in a particular way may be put off by the prayer, but from the reaction, millions of the faithful have no such misgivings. After the book released, through word of mouth, the news spread. Pastors began to call Multnomah Publishers and order cases of the book to give every member of their church. The 30,000 copies that the publisher hoped to sell in a year, instead sold in a month. After twelve months and twenty-five printings, The Prayer of Jabez, Breaking Through to the Blessed Life had sold 3.5 million copies and was on the top of the New York Times bestseller list. In short order, Wilkinson and his publisher created follow-up products including a leather-bound version of the Prayer of Jabez, Prayer of Jabez for Teens then Prayer of Jabez for Kids (Tommy Nelson) and Prayer of Jabez for Little Ones (Tommy Nelson). Also there is a journal, Bible study, and gift edition of the book. The next book in the "Breakthrough series" was Secrets of the Vine and since April 2001, this book has also hit the New York Times list. The third book from Dr. Wilkinson The Life God Rewards launched at New York Times #1. The phenomena continues with Prayer of Jabez for Women by Darlene Wilkinson, Bruce's wife, which has also appeared on the New York Times bestseller list and in the first few weeks sold over 100,000 copies. Part of the most gratifying reaction to the Prayer of Jabez books for Bruce has been the outpouring from the readers. Some of this information can be seen at www.prayerofjabez.com "Everywhere I go people come running up and tell me their Jabez stories," Bruce says. There are literally thousands of stories from readers who tell about various changes to their life after praying the prayer of Jabez. A smoker kicked his habit, a woman saw her broken marriage healed, a ski instructor received high-tech ski equipment, some people meet strangers and share their faith or a lonely divorcee finds friends, and a married woman finds God's help to resist a sexual affair. Some executives use the prayer to expand their business. Wilkinson maintains that's OK. "When Christian executives ask me, ‘Is it right for me to ask God for more business?' my response is, ‘Absolutely! If you're doing your business God's way, it's not only right to ask for more, but He is waiting for you to ask," Bruce says. For writers, the prayer of Jabez can revolutionize their life and expand the reach of their writing to new heights. Today Bruce marvels at the success of his writing. It didn't happen on his timetable but it certainly happened on God's timetable. From Bruce Wilkinson's experience, writers can take the encouragement to persist in following their dreams and continue to ask God to bless, enlarge your territory, that your hand would be with them, and they would not cause pain. Following his own prayers, Bruce moved his family to South Africa in 2002 to help fight AIDS and the widespread famine. He continues to ask God to bless, expand his borders, that God's hand would be with him, and he would not cause pain. W. Terry Whalin understands both sides of the editorial desk--as an editor and a writer. He worked as a magazine editor for Decision and In Other Words. His magazine articles have appeared in more than 50 publications including Writer's Digest and Christianity Today. Terry has written more than 55 nonfiction books and his latest is The Complete Idiot's Guide to Teaching the Bible (Alpha Books). See more about his writing at:www.right-writing.com/whalin.html. For more than 12 years Terry has been an ECPA Gold Medallion judge in the fiction category. He has written extensively about Christian fiction and reviewed numerous fiction books in publications such as CBA Marketplace and BookPage. He is the Fiction Acquisitions Editor for Howard Publishing. Terry and his wife, Christine, live in Colorado Springs, Colorado. • Persist in following your dreams and the desire in your heart, yet constantly be searching to make sure this dream is something that God wants you to follow. • Be actively growing as a writer and learning your craft. Bruce says, "It's the person who stands still who never grows and matures. I always want to be learning and growing." • The answers from God about your writing may not be simple. "Look for open doors in your life from God, then be prepared to move ahead with these opportunities," Bruce says. "I never imagined that God would move my family and I to South Africa but our move was confirmed in multiple answers to prayer and other confirmations. I'm certain it was the right next step for me. Your next step will be completely different and remember that God's timing is never late." The Altered Sized Exercise: As with the previous exercises, this is best done when there can be a second person to serve as secretary, either by taking notes or using a tape recorder. The participant sits in a chair, closes his or her eyes, and relaxes. The secretary/exercise partner asks the participant to describe a specific setting i.e., "What did your kindergarten classroom look like?" The participant must then give as many details about the size of the room, how it was decorated, what sort of furnishings were in it, how the teacher and other students were dressed, and even the amount of natural and artificial light in the room. This should be told in present tense verbs, such as "The American flag above the door has only 48 stars because this is the early 1950s. My teacher is wearing a yellow scarf in her hair." Once this description ends, the secretary says, "Now I want you to pretend that you are a six-foot-tall adult walking into that same room. Change your perspective and talk to me about the room again." When that description finishes, the secretary says, "Okay, now I want to be the size of a mouse scurrying into that same room. Change your perspective once more and describe the room again." This exercise turns the writer's eye into a probing camera, discovering what things looked like to both the students and the teacher. It reveals a shift in priorities, as what is eye level for a child is not the same thing at eye level for the teacher. When transformed into a scene in a novel or story, the setting becomes three-dimensional, graphically detailed, and visual. The X-Ray Machine Exercise: In this exercise the participant sits in a chair with eyes closed and relaxed. The secretary then "takes" the participant to a specific scene, such as atop a glacier, outside a skyscraper, or before a jungle. The secretary says, "You have X-ray vision. Without moving, I want you to look deep into this jungle and tell me all the things you see there." The participant will then begin to talk. "I see a lot of twisted branches curling over each other. Bright birds of green, red, and yellow are flitting from branch to branch, sometimes being scared away by spider monkeys that are making lots of noise. Farther on there is a swampy area where crocodiles are floating like lifeless logs. Lots of mosquitoes are buzzing around." This exercise gets a writer into the habit of "seeing beyond" the obvious. What is inside? What actions are taking place? What conflicts or challenges are the people inside facing? Answering these questions not only helps create a plot, but it supplies the details of the setting of that plot. The Time Travel Exercise: In this exercise the participant sits in a chair relaxed. The secretary says, "Take a couple of minutes to give me a description of the neighborhood where you live" (or the school where you teach or the factory where you work, etc.). The participant will then provide the description. The secretary will say, "Okay, now I want you to move ahead 20 years in time. What does your neighborhood look like now?" As always, the secretary should take notes. After the description of the future scene ends, the secretary should prompt follow-up comments from the participant by saying such things as, "You mentioned that the area homes now have bulletproof glass. How are you feeling about this?" Or, "You said that many of the lawns are now made out of astro-turf instead of real grass. Do you find this attractive or ugly?" The point of this exercise is to prove to the participant that his or her powers of speculation are sharp, that stories are right under his or her nose, and that as environments change so do the people within those environments. Such alterations and challenges and changes can often provide plot conflict for a story. Sometimes people say to me, "I'd like to take one of your writing classes, but I'm afraid to. I've never had an original idea in my whole life." This lack of originality is usually not because a person is less intelligent than others, but more because he or she has not be shown how to engage the mind in creative thinking. By using these various exercises, anyone can enhance intuitive reasoning, blend the logical and creative parts of the brain, and, quite often, come up with a plot idea worthy of selling. Now, there's something to think about! Dr. Dennis E. Hensley is director of the professional writing major at Taylor University Fort Wayne (IN). He is the co-author of the Leslie Holden mystery-romance novel series released by Harvest House and also the author of such writing books as How to Write What You Love and Make a Living at It (Random House) and Alpha Teach Yourself Grammar and Style in 24 Hours (Macmillan). Many people want to write a nonfiction book but they don't know about proposals. Typically, they start with a blank page and an idea, and they write their entire manuscript. These unpublished writers do not understand how 80 to 90 percent of nonfiction books are sold. Because of a lack of understanding, unpublished authors never sell their book manuscript to a publisher. If you want to sell your book idea, then you need this ebook! It launched a few days ago. Author W. Terry Whalin has written more than 60 nonfiction books (all with traditional publishers). He understands what is required to produce a nonfiction book proposal. He has collaborated with a number of different people on nonfiction book projects. Also, Terry is an acquisitions editor—often the first person to read these nonfiction book proposals. 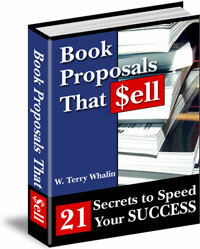 This book contains his insight and experience regarding book proposals that sell. His stories and insight will show you how to avoid the pitfalls of rejection. If you want to write a nonfiction book, then your first step is to learn how to write a nonfiction book proposal. You need Book Proposals That Sell, 21 Secrets To Speed Your Success and you can have this product in a few instant clicks for only $19.95. Besides the ebook, Book Proposals That Sell includes a real nonfiction book proposal that Terry wrote (and an agent sold) for a six-figure advance from a traditional publisher. Besides several valuable appendices in this ebook, Terry includes several bonuses with each purchase. 1. The Ultimate eBook! by Tom Hua which includes top quality ebooks that you can read, resell, or give away to others. 2. Copyright Basics ebook that explains copyright law in an easy, step-by-step format. 3. Auroresponder Magic, the Ultimate Collection of Winning Autoresponder Messages to Put Your Website on Autopilot! This book is a $495.00 value. If you need to send automatic messages for any reason, then you need this large reference ebook. If that's not enough of a reason to get started right away - I don't know what is. But, if you're still looking for a reason this is "too good to be true" - you're covered by our "100% Love-It-Or-Leave-It Guarantee" Your success in using Book Proposals That Sell is completely guaranteed. In fact, here's my 100% "Love-It-Or-Leave-It" Guarantee: If you're not absolutely ecstatic and thrilled when you get this ebook - for any reason at all - I'll cheerfully refund your money. No headaches, no hassles and no weasel clauses. You've got one full month to check out the quality of the information and if not satisfied ask for a full refund! There is absolutely no risk, whatsoever on your part. The burden to deliver is entirely on me. Tucked away in the last chapter of Romans is a seemingly obscure verse: "I, Tertius, who wrote down this letter, greet you in the Lord" (16:22). Tertius was a scribe, and the ministry he performed was an important one. Though his function was little more than that of a secretary, Tertius stands as an example to Christian writers: he faithfully committed to paper the things he heard from the Apostle Paul. When I once referred to Christian writers as scribes, a friend of mine started to chuckle. He was thinking of what Jesus said about the scribes and Pharisees--and he didn't think that was quite appropriate! I would never want to align myself with those vultures that tried to trap our Lord with words. But Jesus also spoke of the scribe who was "instructed in the kingdom of heaven, . . . which bringeth forth out of his treasure things old and new" (Matthew 13:52). What is a scribe? The literal translation of the Greek word means a professional writer. That's what Tertius was--a professional. And professionalism is the goal we should seek. I am not, of course, advocating becoming a "professional" (hack) writer, the type that can slant an article for or against any viewpoint, depending on who is paying. I am speaking of the kind of writer that has, for example, learned the basics of grammar, punctuation, and syntax. A professional does not need to be trained in the proper use of tools; only the apprentice does. A professional does not deal in trite phrases and overused ideas; instead, he takes from his treasure things old (research and study, especially in the Scriptures) and new (insights gained from a fresh walk with the Lord). If you are a professional in the strictest sense of the word--in other words, if you make your living or at least supplement your income by writing--there is a danger you must avoid. That is the fact that you tend to think in terms of writing for money, and I cannot think of a better way to dam up the creative flow than the desire for remuneration. It is a sad fact that there are scandalously small financial rewards for the average freelancer. Those who are only willing to write for the higher-paying periodicals are apt to become discouraged very quickly. And if you allow yourself to think that your highest-paying pieces are your "best" writing, you can place an over-emphasis on the marketing of your material. Once you stop concentrating on developing your writing skill you lose control of your craft. A professional writer seeks honest payment for honest work, while at the same time not allowing payment to cloud his or her calling from God. Another mark of the professional is the discipline of staying fresh in your walk with God. The scribe of the kingdom brings out of his treasure things old and new. But we have so many wonderful commentaries and study guides and devotionals that we sometimes cannot hear God's new message to us. Material to enhance the study of God's Word is useful and helpful, but it must be balanced by spending time alone with Him. Knowing much about God is a poor substitute for knowing Him. It is through that relationship that the real writing ideas--and the spiritual power to communicate them--are cultivated. David E. Fessenden is a freelance editor and consultant for Honeycomb House Publishing. The author of four books and dozens of articles for magazines and newspapers, he also serves as a columnist for Cross & Quill and a mentor for the Jerry B. Jenkins Christian Writers Guild. Dave and his wife Jacque have two adult sons. Our vernacular has changed over the past years due to our sensitivity over the generic "he." For some it is a matter of being politically correct. For others it is merely a way of being inclusive of both genders in their writing. In addition it can be simply a matter of using the common language of everyday speech. So what is correct? I have polled a number of editors on this subject and find them equally divided. Some trained in journalism and others who are fierce copy-editors are vehemently opposed to the use of the "singular their." Others claim to be more concerned about simple communication and lay the finer points of grammar aside. Yet even they are not unified on the issue. There is an entire website devoted to this question (The Anti-Pedantry page can be found at:http://www.crossmyt.com/hc/linghebr/austheir.html). Member of the Copyediting-L e-mail list state, "‘They’ with a singular antecedent works well, because it’s already part of everyone’s vocabulary. Like the generic ‘he,’ it entails no new words, just a shift in semantics...[it] is just one item in the toolkit of those who wish to avoid using generic ‘he.’ It isn’t the only item, and it doesn’t fit every situation, but it is useful." My feeling is that it is entirely appropriate to use the “singular they.” We need to adjust, ever so slightly, to accommodate the changes in our language. While not succumbing to the landmine of being politically correct, I do believe that there are appropriate places to use “ungrammatical” words to effectively communicate to our readers. Richard Lederer provided a wonderful exercise to illustrate the point. Fill in the blank in the following sentence: “Everyone in the building attended the party, and ___ had a wonderful time.” I suspect that nearly everyone supplied the word they. Steve Laube is a literary agent for The Literary Group International (www.theliterarygroup.com). He is a 23-year veteran of the book industry with experience at both the retail and the publishing level. Prior to becoming an agent he rose to the position of an editorial director for Bethany House Publishers. He and his family live in Phoenix (for more information see www.stevelaube.com). Maybe you've never heard of the American Society of Journalists and Authors (ASJA). It's the top nonfiction writers group in the nation with over 1,000 professional writers. If you check their website (www.asja.org) you will see the high standards for membership. The members write for many of the top high paying magazines and many bestselling books. The majority of the ASJA writing isn't as a hobby or for a ministry but instead to simply ply their craft with excellence and make a substantial living in the process. Now you can tap into their expertise with this new book. It's almost like going to one of their annual conferences except it's in book form and anyone can get it. Throughout my reading of this book, I kept a yellow highlighter handy. A different ASJA professional, writes each of the twenty-six chapters. Are you planning to make the leap from part-time writer to full-time? Then you need the advice from Erik Sherman about how to plan a writing business. Or maybe you are asking the age-old question from writers, where do ideas come from? Jack El-Hai who primarily writes about medicine and law for publications like the Atlantic Monthly and American Heritage will give you his years of experience about where to find ideas. He says, "Not all ideas are equal. The best ideas will carry an emotional wallop, be timely, hold your own interest, and directly affect the lives of your readers or pique their curiosity…And they must be what professional writers call ‘saleable.' That means they must compel an editor to make the assignment." Possibly your magazine query skills need some help. Lisa Collier Cool, author of How to Write Irresistable Query Letters, has a chapter called, "Seven Secrets of a Successful Magazine Query." Lisa writes, "A query letter—a combination article proposal and sales pitch—is one of the experienced, professional writer's most effective ways of finding work and building up business. It is also the fastest, most efficient way for beginners to break into print. In the time it takes to research and write one story, you could craft several queries, greatly multiplying your odds of a sale. Using a proposal instead of a finished article also lets you get timely ideas out quickly, and reduces time wasted on unsalable projects." Here's some of the other topics addressed: networking, selling a book, literary agents, research, how to find experts, collaboration, self-publishing, the serendipity of specialization, reprints, contracts, taxes, and even how to set up your office as a writer and what tools to use. Even the Appendix of this book includes a series of valuable one paragraph writing tips which are not incorporated into any other chapter in the book. For example, Florence Isaacs, a past ASJA president, writes, "Try to use provocative titles for article queries, such as "Killer Foods" for a piece on food poisoning, or even "Fat Kids" for an article on overweight children. Although the titles may not actually be used as cover lines, they do grab an editor's attention and can help you get your proposal to the top of the pile." These one-paragraph tips also include very practical suggestions like Mary Mihaly wrote, "Your chair should be strong and have a full back (not a huge space between shoulders and rump) so you'll "feel supported" at work." As Samuel G. Freedman, professor and associate dean of Columbia University Graduate School of Journalism writes in the foreword, "Chapter by chapter, the working writers who wrote this book share the concrete details of the writing life…What you read in these pages is what you would hear working writers talk about over coffee or cocktails." No matter where you are in the writing journey, you will profit as you spend time reading this book. I recommend every writer pick up a copy of this valuable resource. No matter what you think of the Prayer of Jabez book, you have to admire Bruce Wilkinson's persistence with this idea. Then when the timing was right, Bruce plunged ahead. It should encourage each of us to look for that perfect moment. Let's also note that the little verse about Jabez has been in the Bible for centuries. It was simply the right timing for this particular book. Dr. Dennis Hensley gives us three new exercises to improve our mental memory and our fiction. Select one of these exercises and practice it today. Then tomorrow, select one of the two remaining exercises. Finally, on the third day, try the final exercise. Are you gaining a fuller use of your brain power? What personal insights about the marks of a professional can you gain from David Fessenden's thought-provoking article on this topic? Is there insight into the overall field of professional writing that you can apply into your writing life? Grammar in the English language isn't standing still. It's clear from Steve Laube's article about A Can of Worms. On May 6th, I will be chatting live at the Institute of Children's Literature and talking about the Growing and Changing Christian Magazine and Book Markets.. If you would like to participate in this chat, then go to this page. Otherwise you can check back in a few days on this website to read the transcript. On May 16-20th, I will be teaching the adult nonfiction book continuing class at the Blue Ridge Mountains Christian Writer's Conference in Asheville, North Carolina. If you want to learn more about this conference or possibly attend then use the link on the conference name.